Olentangy Berlin junior Jessica Nation (center) fights through a crowd in the Bears’ scrimmage against Big Walnut earlier this month. 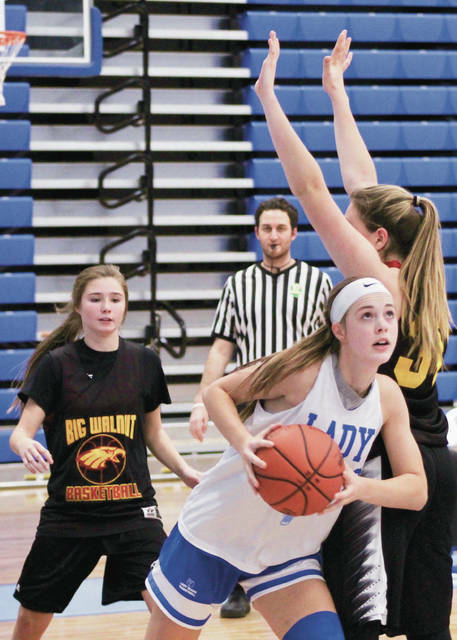 There’s a level of cohesiveness with the new Olentangy Berlin girls basketball team. The first-year program has a first-year coach and everybody has a clean slate. Like most Berlin squads, this team is made up of former Olentangy players right down to head coach Megan Beidelman, who is a first-time head coach at the varsity level and a former Olentangy player as well. Her high school playing days aren’t too far back in the rear-view mirror. She graduated from Olentangy in 2013 before moving on to Mount Vernon Nazarene where she led the Cougars in scoring her junior and senior seasons. But Beidelman doesn’t want to lean on her roots too much. She’s trying to build a new identity for the Bears … and the first impression is important to her. The inaugural Berlin squad has 20 girls overall in the program with four that saw at least some varsity playing time last season at Olentangy. The most experienced of that group are junior Jessica Nation, who led Olentangy in scoring last season, and sophomore Courtney Suchan, who played in all 24 games. Junior Haley Cera and sophomore Maddie Goodman also saw time last season. While wins and losses are important – Beidelman and the Bears are using culture as the foundation for years to come. Obviously, we’re here to win games. But like I promised the parents at the beginning of the year – when they leave this program, I want them to be better people who are going to have an impact on much more than the basketball court,” Beidelman said. Juniors Shea Palmer, McKinley Hoffmann, Meghan Boggess and Kenzie Hinton; sophomores Gwynne Kiener and Jenna Boucher; and freshman Lexie Syroka fill out the inaugural roster for Berlin. The new Bears will compete in the OCC-Cardinal with Delaware Hayes, Dublin Jerome, Dublin Scioto, Hilliard Bradley, Hilliard Darby, Thomas Worthington and Worthington Kilbourne. Scioto and Thomas shared the league title last season.